I’m a backpacker at heart: I take dusty trains across far off landscapes, I dash through metro stations, walk along ancient cobbled streets looking for tucked away accommodation, ride questionable buses on questionable roads, I stay in dorms, in hostels! I didn’t think I could work a wheeled luggage into my travel style, but I found the perfect wheeled pack: the Osprey Ozone 36! While I’ve considerably downsized my backpack since my first big trip, I still look on in mild envy at those carefree travellers with wheeled cases. Carrying a hefty DSLR camera, plus lenses, and a laptop, as well as a backpack can be a bit of a strain, especially in blisteringly hot, humid countries. I love to be on the move but I can dread transit days when I know there will be lots of changes and walking. 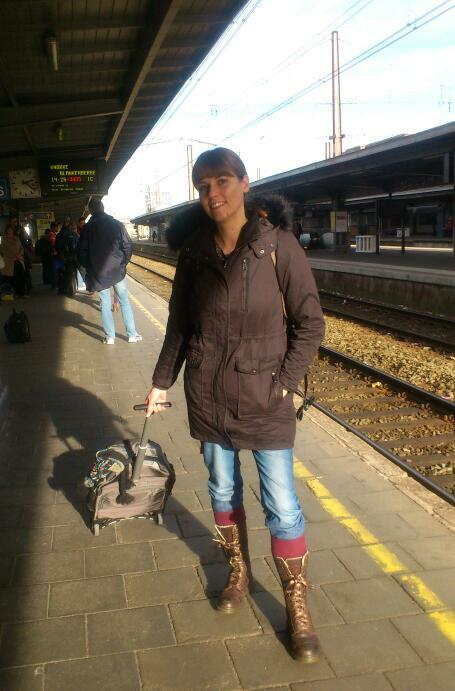 That was the reason I chose a carry-on size, 40 litre backpack for my rail trip to South East Asia in 2013/14. It was so refreshing to have such a small pack, yet even then, I found it heavy and cumbersome: the backpack strapped to my back, my camera bag strapped to the front, I looked like a sweaty tortoise! 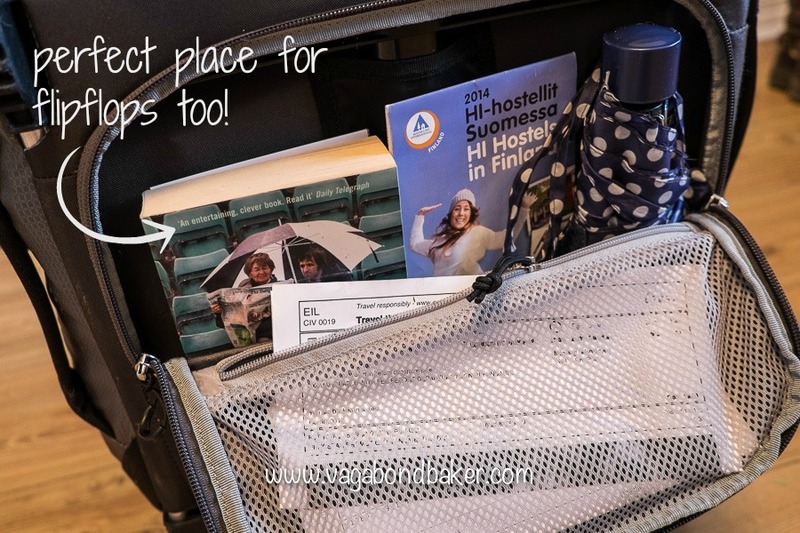 A wheeled bag would make things so much easier, but is there a wheeled bag that can suit how I travel? I had an inexpensive wheeled case that I used for the occasional weekend break, but it was frustratingly bad to drag along, it would always flip over, the wheels were wobbly and the case looked completely cheap and ready to fall to pieces at any moment. I’d looked into upgrading it for my northern Europe rail trip over the winter but all the fancy carry-on cases just didn’t seem to do it for me. Then I came across the Osprey Ozone range, all my backpacks have been Osprey and they have been excellent. 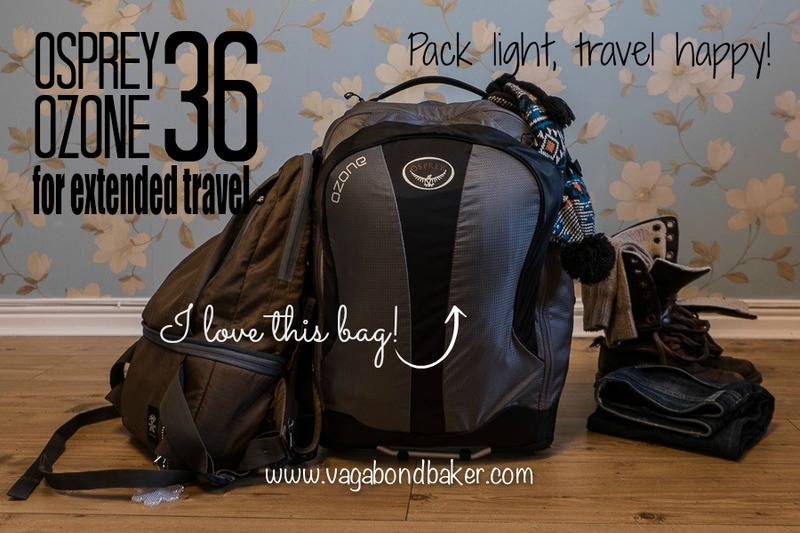 Their smallest, lightest carry-on sized wheeled pack is the Ozone 36: I was immediately won over! It was a bit of a last-minute buy: 2 days before I set off on the Eurostar to Belgium. My only concern was that, at 36 litres, it had 4 litres less capacity than my carry-on backpack (the Osprey Farpoint 40), I would have to travel even lighter! 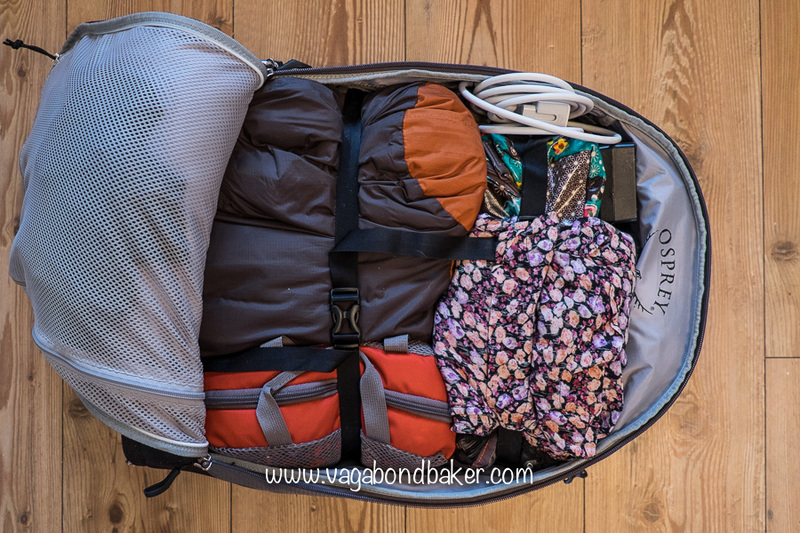 This wasn’t a huge problem, I have this packing-light lark down to a T; despite heading to Nordic Europe in winter I still managed to fit everything into this compact, light bag. I share my secrets in this post! I travelled with it for just over 2 months, giving it a thorough road test. My now-beloved Ozone 36 has successfully coped with Europe’s abundant cobblestone streets, snow, rain, and countless train journeys. Here is a little tour of my bag, and the reasons why I completely love it! First off, it doesn’t look like a wheely case: it still looks like a backpack. Yeah, you still look a little bit adventurous with it! The best thing about the Osprey Ozone 36 is the wheels, they are amazing. It’s like having a Landrover instead of a car, this thing can go off-road! The wheels are big and robust, they coped magnificently well with the cobblestones; I’ve pulled it across grass, through gravel and through snow with no problems. These wheels have a high clearance: you can pull the pack up curbstones with ease and I’ve pulled it up steps too. It never flips over, it feels sturdy and well-built. The Osprey Ozone 36 is with packed with useful pockets, like this one on the very top. I use it for my chargers and cables, for easy access without having to open the full bag. I think it was designed for the clear plastic liquids bags needed for carry-on flights, I would use it for that if I flew with this bag. No such need for this when overlanding on the train though, hoorah. 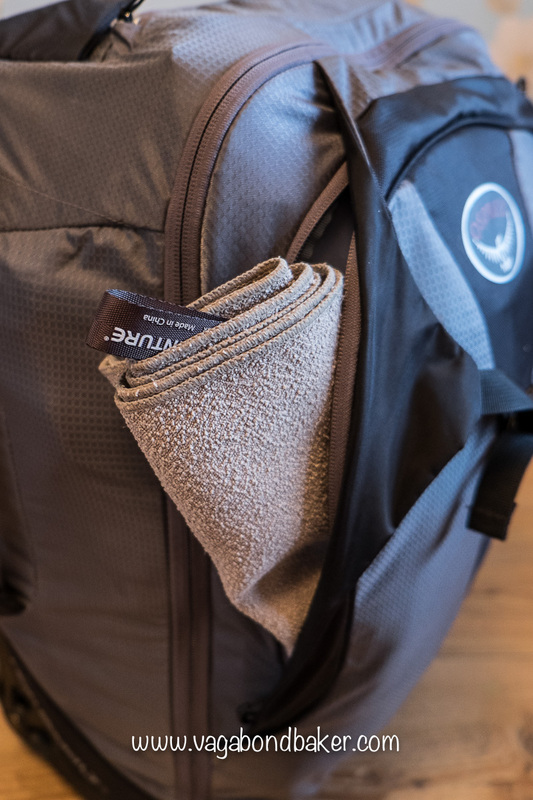 There are two slim pockets on the front of the pack: I kept my travel towel in one, so I could pack it last-minute if it was drying. A useful, slim pocket in the back of the pack is perfect for magazines, books and tickets. I kept my umbrella in here, it would also be great for flip-flops too. Inside the Osprey Ozone 36 there are internal side pockets and a big webbed pocket on the inside of the lid. Robust straps compress your things securely: I use stuff sacks and they fitted perfectly in here. 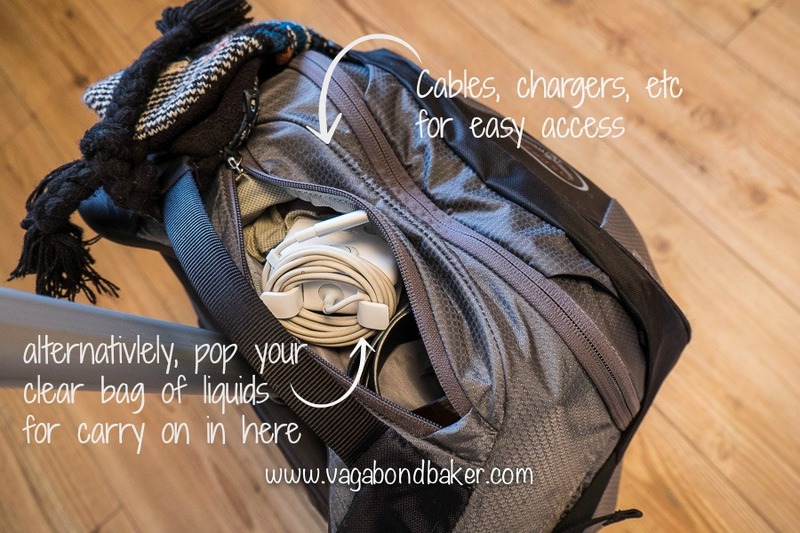 The pack zips wide open like a clam giving you easy access to all your things, and making it quick to repack. The pack’s compact size meant I could put it into lockers or slip it under the bed in hostels and hotels. When travelling with it on the train (on many trains!) it fitted easily into the overhead luggage racks, and at less that 9 kgs fully packed it wasn’t a struggle to get it up there either. I rolled it on its back under the seat sometimes, if there was room, its dinky size means it’s not a challenge to travel with. More than any other form of transport, this pack was made for adventurous train travel. It made my Euro rail trip effortless. I can see that it would be excellent as a carry-on bag for flying too (which is what the Ozone 36 was really designed for!). It has a sturdy, retractable T shaped handle that fits neatly down into the pack when not in use. I found it comfortable to use and a good height. Empty, the Osprey Ozone 36 weights less than 2 kgs, which is pretty light for a wheeled pack and it has padded handles on the top and sides for when you need to carry it. I really cannot fault this pack, it was a joy to travel with and I will definitely be using it for most future trips. I think I will still use my Farpoint 40 backpack for some destinations, the Ozone 36 wouldn’t be so good for taking on motorbikes, and not everywhere in the world is suitably paved. It maybe awesome off-road, but there is only so long you can repeatedly drag a pack over challenging ground before it becomes a chore. The destination will pick my pack, but at least now I have two amazing packs to choose from. It retails for around £100. 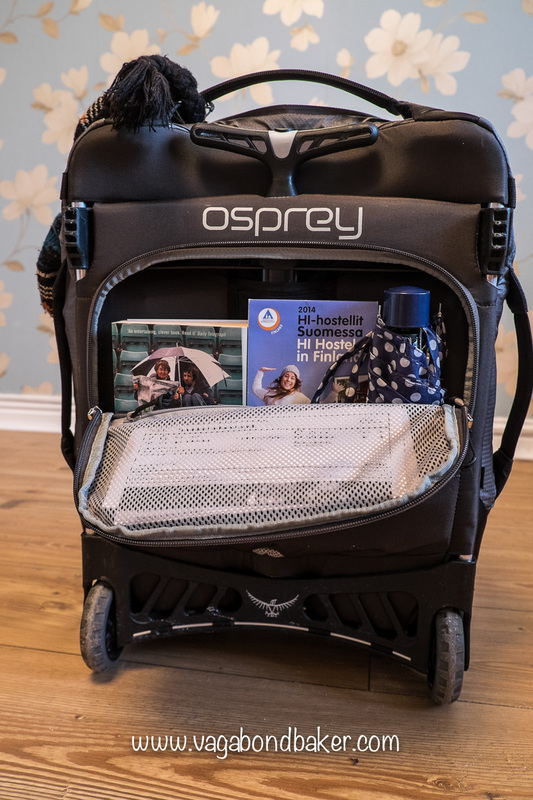 I heartily recommend the Osprey Ozone 36, if you’ve been looking for a lightweight wheely bag, this may well be the pack for you too. Disclaimer: I bought the Osprey Ozone 36 with my own money; Osprey have not contacted me, paid me or requested this review. All thoughts are entirely my own, I’ve used this bag thoroughly on my travels. 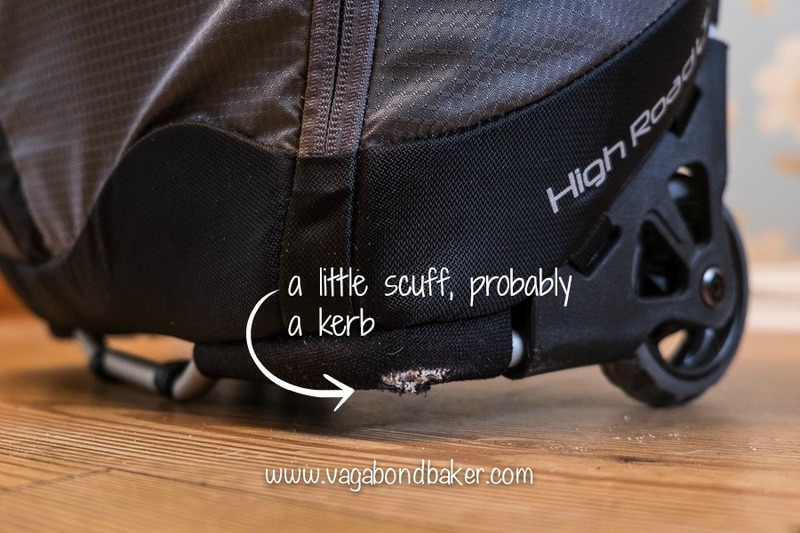 Are you considering wheeled luggage? Have you used it too? Share your thoughts below! Great Rachel, I enjoyed reading this. I’ve just bought the same case except the convertible version (marginally heavier) so I can strap it to my back when there’s either lots of stairs, cobbled streets or I need my hands free. It arrives in a few days hence why I was reading about it. Also not overly keen on losing 4 litres but at the expense of not having stress induced comas from worrying about being hauled over the coals for my bag hand luggage being too large it is probably worth it. One thing I’m also aware of is that the more space I have, the more unnecessary things I pack so 36l will probably be fine. I would ditch your books and take a tablet if you want to save even more space 🙂 Only concern with this pack is the durability of the materials so I do think it will last given some care but time will tell. Good to hear Alan! As far as the durability goes I’ve had no problem with any of my Osprey packs and I’ve fairly put them through some hell! This one has faired excellently in my 5 week trip in Finland this month, through snow, ice and grit. The wheels did jam a bit in some of the icy conditions but not to any unusable way, they soon freed. 36 has been perfect for me, even for a sub zero winter trip to Finland, you just take what you need! Thank goodness for tablets, I love real books but the fact that I can get thousands of books on a tablet just makes so much sense. In fact I only brought my smart phone with me on this trip, along with my laptop to work on. The weight can still be an issue for some of the airlines, I flew out here with BA and their generous 23kg hand luggage allowance, but I’m flying back with Norwegian Air and that only has 10kg, it’s going to be tight! I’ll maybe have to wear a few extra layers! I have sent a couple of souvenirs home by post! I just received the bag which is identical to yours except there are now cut outs on the base of the frame where yours has torn – so they’ve fixed that design flaw. Also, as I said, mine converts into a backpack which the negative is it means the space where you’ve placed your umbrella and books is basically full with the backpack harness with no real space left. I think it’s a reasonable compromise because I really do want to have the option of slinging it on my back. Excellent straps with plenty of venting and almost up there with a dedicated hiking pack. Amazed with the lightness of the bag considering all of the features – if TNF made the same bag it would weigh 1kg more and be double the price. The materials are very thin particularly inside but as long as it isn’t over packed, I think it can last. Speaking of which, the only disappointment is nowhere specifically for a laptop/tablet. The size of the bag means you really do have to justify everything that you pack and I immediately realised that even though I consider myself to be very efficient, passing on tips to someone who has it ‘down to a T’ is very difficult. I will try though. I recently bought a Sony RX100 which gives ‘almost’ DSLR quality due to it’s large sensor size but is pocket friendly, great in low light and also charges via micro USB which means no extra charger. I also have an Airvantage body warmer which is awesome in really low temperatures, for example, I used it skiing and on motorcycle and stayed warm but the insulation is adjustable can cope with warmer temps as well. If you aren’t familiar then you blow air into it which the more you add, the more insulating it is as air is a poor conductor of heat. At the end of the day you let the air out the value and it packs almost flat. It inflates and deflates whilst being worn and just takes a few seconds to do. I find that with the Airvantage body warmer and a Goretex jacket I have both a weather shield and adjustable insulation without much bulk. Also with the AV having no sleeves means it’s still great for climbing etc as you have full mobility. Look into it. Weightwise, I got it to about 8kg with it 80% full so I think I’m not going to attract any attention from airlines, so I’m curious what is making your bag so much heavier. Totally agree with your point about the wheels being oversized and therefore well rolling.